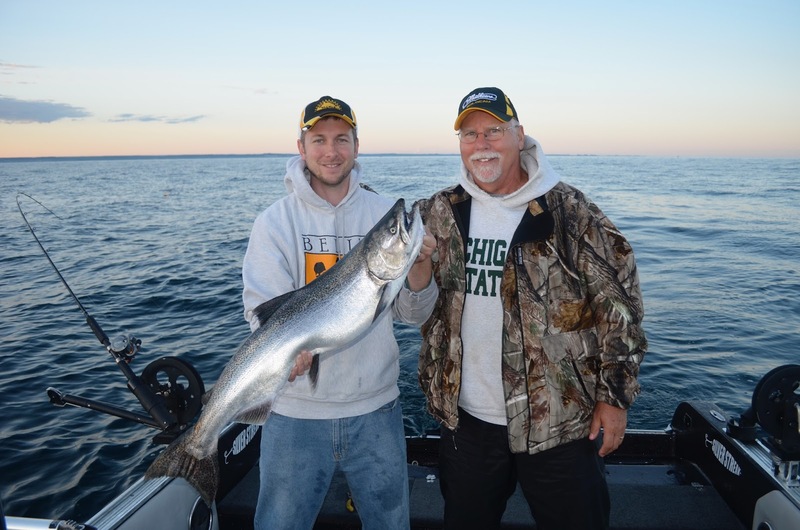 King salmon are just one of many species commonly caught on downriggers. Nick and Dale Voice teamed up to catch this nice fish out of Manistee, Michigan. Downriggers are often touted as essential equipment among anglers who routinely fish in deep water. The truth is downriggers are also useful for a much wider range of trolling situations. Downriggers are the “ultimate weapon in depth control fishing”, because they can also be used to “double down” on fish. unique release two rods can be fished using just one downrigger. Imagine fishing two rods and lures using just one downrigger. It’s easy with the help of an unique line release known as a stacker release. A stacker is actually two releases connected together with a short and slightly longer length of steel leader material terminated using a heavy duty snap. Before we can jump into discussing how to rig a stacker as a second line it’s important first to describe how to go about rigging the main line. Start by letting the desired lure 20 or more feet behind the boat. Grasp the line near the rod tip and place this line between the rubber pads of the downrigger release attached directly to the back of the downrigger ball. Open the bail of the reel, engage the bait clicker and lower the downrigger ball about 10 to 15 feet down into the water. Now that the first line is set, it’s time to grab a second rod and a stacker release. Set the second lure behind the boat just 10-15 feet. Now take the heavy duty snap on the stacker release and clip it over the downrigger cable. Grasp the stacker release on the short leader, pinch open the release and place the rubber pads on the downrigger cable. The final rigging step is to take the line from the second rod and place the line between the rubber pads on the stacker release attached to the longer leader. At this point make sure the bail is open on both rod/reel combinations and the rods are placed in nearby rod holders. Lower the downrigger weight to the desired fishing depth and reel up the slack line. 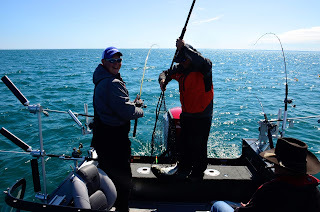 Fishing a stacker not only allows two rods to be fished with one downrigger, it enables anglers to fish at two different trolling depths and also to use two different trolling leads and or lure types. The second rod is normally positioned 10-15 feet above the main line, but these numbers can be adjusted as dictated by fishing conditions. Also the lead lengths between the main line and the second line can be manipulated, so long as the lead on the second rod is always shorter than the main line. one rigger with the help of a stacker release. Stacker releases allow anglers to effectively “double down” when trolling for trout, salmon, striper and even walleye. Stackers work great, but they are not the only way to fish two lures on one downrigger set up. A rigging option known as an Add-A-Line is a simple way to fish a second lure using just one rod and reel. To rig up an Add-A-Line start with a six foot length of fluorocarbon leader material. Thread a line release onto the leader material and terminate with a snap on one end and a ball bearing swivel on the other. The most common releases used for Add-A-Lines are smaller models like the Off Shore Tackle OR10, OR14 and OR19. 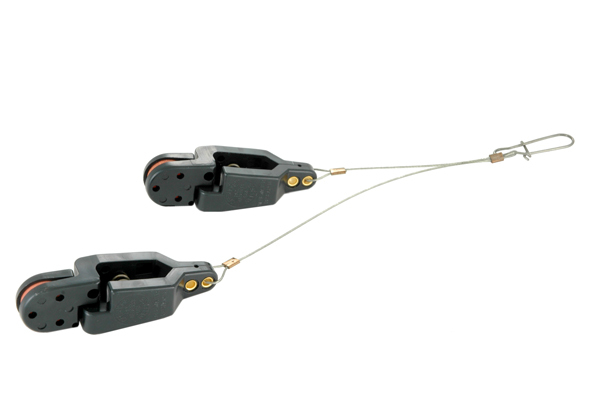 The OR10 is a light tension release and is normally used for smaller fish like walleye. The OR14 and OR19 are medium and heavy tension releases typically used for trolling up brown trout, lake trout, salmon and steelhead. Before the Add-A-Line can be set, the main line needs to be rigged. Let the main line and lure the desired distance behind the boat and place the line into the line release on the downrigger weight. Next, open the reel bail and engage the bait clicker feature. Now lower the downrigger weight 10-15 feet. Take the Add-A-Line leader, open the snap and place the snap over the main line. Close the snap and then take the release and pinch it onto the main line. This effectively pins the Add-A-Line in place. Finish the rig by adding the desired lure to the snap swivel and tossing the lure into the water. Now lower the downrigger weight to the desired fishing depth. The Add-A-Line allows for a second lure to be fished when using just one rod and reel. This set up also pins the second lure at a desired depth level. When a fish hits the lure on the Add-A-Line there is resistance provided by the line release insuring a good hook set. When a fish is hooked on the Add-A-Line, the angler trips the main downrigger release and reels in the struggling fish. The Add-A-Line slowly slides down the main line until it hits the terminal end. The Add-A-Line takes a little more time to rig and fish than “slider rigs”, but they also tend to hook and land a higher percentage of the fish that strike. The “slider rig” is little more than a lure on a short leader that is clipped over the main line and allowed to slide up and down the main line. When a fish is hooked on the slider, the angler must reel in line quickly to come tight on the fish before it escapes. Because there is no resistance on the slider, the percentage of strikes that end up as hooked and landed fish is much lower than Add-A-Line set ups. A lot of different lures can be used when fishing stacker releases and Add-A-Line set ups, but the most common choices are trolling spoons, plugs, spinners and cut-bait rigs. 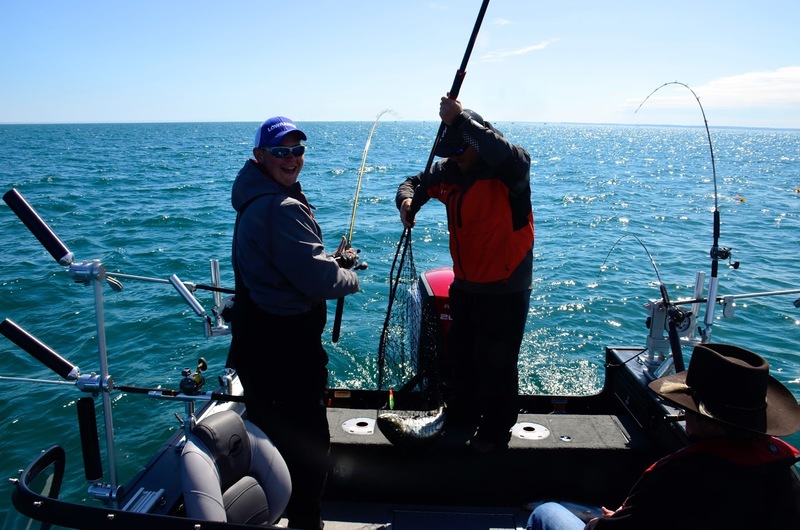 Downriggers are the ultimate in depth control fishing and they can also be used to double down on walleye, trout, salmon, striper and more.